You’ve nursed your dream along slowly, patiently with equal parts of blood, sweat and tears. And now it’s starting to blossom and grow. People are noticing you, your business is growing. You’ve gone from a one-man show to hiring employees. Congratulations. Take a moment and smile and thank everyone for their support and commitment. But only a moment. Then it’s back to work. Now you have a decision to make: Are you going to be a boss or a leader? The difference is, in a word, huge. 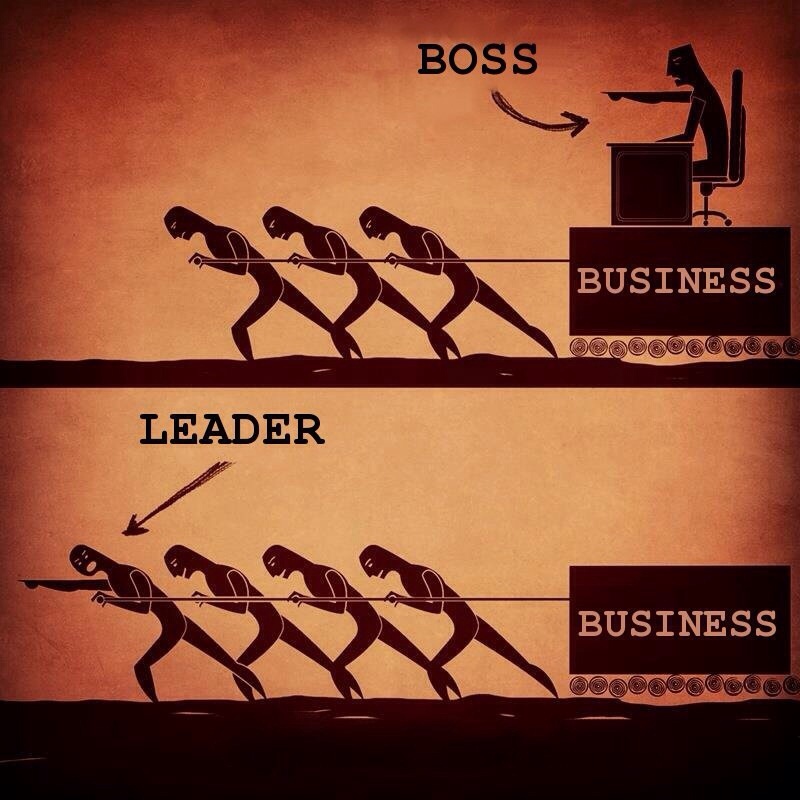 The difference can be summed up in a meme that is popping up all over the place these days: A boss tells you what to do, and a leader is out there with the people leading the way. To be sure, there are times when a leader has to do some telling, or be a boss, but a leader never makes that his/her main way of directing or leading. The boss stands apart from people not with them. Sometimes it is necessary to stand apart for a few moments to take a breather (momentary) and look at the big picture. But after the breather, the leader jumps back in and is back in their shoulder to shoulder, and elbow to elbow with everyone else. Working with and leading your employees will give you not only a better vision of where you’re taking your own dream, but also a vision of life in the trenches of your own company/enterprise/dream. And both those visions will make things better for everyone, if you’re able to retain your humility and understanding. A Google search will reveal a whole host of lists of characteristics that differentiate leaders from bosses. Some of those include listening to their employees and valuing their employees; leaders don’t’ command/tell, they lead. Leading by example is the best way because the people actually see what it is that needs to be done, and can learn from you as they work next to you. Leaders lead and learn simultaneously. They have the idea and vision of where to take things, and so they must lead, out there in the front blazing the path. But as they do that, they also share with everyone else, their vision and excite them about it. At the same time, they recognize they don’t know everything, and they are smart enough to know when to keep their mouths shut and listen and learn from someone else, even if that person is the lowest person on the totem pole. A leader knows that everyone is smarter than him/her in at least one area, and they are willing to learn from others. Leaders also motivate; they don’t use fear to move their people. Fear only works as long as someone is there with the gun, the stick, whatever the fear factor is. Motivating with vision gets down inside people and stays long after the boss has left the building. The next step up the ladder is the servant-leader. Besides just being out there working shoulder to shoulder with their employees, the servant-leader does their level best to make sure the employees—and therefore also the clients/customers—are being served. Is this job helping this person (or my people) grow and become better? Is this company serving its employees in the best way possible? Are we serving the community in the best way possible? If the servant-leader believes an employee will do better in another job they will help their employee find something better, be it in their own company or elsewhere. They encourage their people to educate themselves not only in the things of their business, but personally, recognizing that education opens more doors and possibilities to their employees. But they don’t hesitate to lower the boom when necessary. The question is what kind of leader will you be?